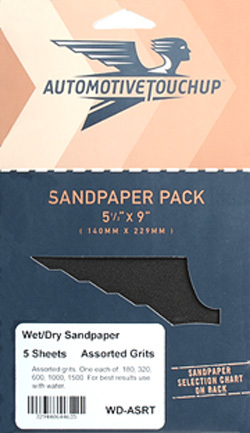 Automotive Grade Sandpaper is used for sanding old finishes or perfecting new finishes. For help selecting sandpaper, visit our sandpaper selection chart. Different grades are for heavy sanding, light sanding, polishing clear coats, sanding primers, etc. This assorted grit multi pack contains the most popular grits used in repainting a car. Warning: Do not breathe the dust created by sanding car paint or get it into your eyes.